FILE - Angolan President Jose Eduardo dos Santos attends a party central committee meeting in Luanda, Dec. 2 ,2016. He is stepping down after 38 years in power. Excitement and suspicion are swirling around Angola's capital as the nation readies itself for a historic vote Wednesday, in the first election many citizens will have seen without the longtime president on the ballot. Jose Eduardo dos Santos is stepping down after 38 years in power. Five parties are challenging his powerful People's Movement for the Liberation of Angola, or MPLA, which has ruled since independence in 1975 and is widely expected to win again. Already, the two main opposition parties, the National Union for the Total Independence of Angola, or UNITA, and Broad Convergence for the Salvation of Angola Electoral Coalition, or CASA-CE, have said they see irregularities in the election preparations. The parties accused the MPLA of using government vehicles and resources for campaigning, and they alleged the state broadcaster has given preferential treatment to dos Santos' party. The MPLA has denied irregularities. The youth-oriented CASA-CE this week cast further doubt over the integrity of the election by announcing it would make an independent vote tally in Wednesday's poll. 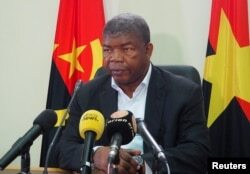 Joao Lourenco, presidential candidate for the ruling MPLA party, speaks at a news conference in Luanda, Angola, Aug. 22, 2017. CASA-CE candidate and spokesman Lindo Bernardo Tito said his party fears the MPLA will rig this vote to ensure that MPLA maintains power and dos Santos' chosen successor, Defense Minister Joao Lourenco, takes office. "The ruling party installed in this country does not guarantee fair, free and transparent elections," he told VOA. The electoral commission has dismissed allegations and maintained the vote will be free and fair. Still, analysts and voters say this is an important opportunity for the oil-rich nation. It could, said professor Riuk Andove of the Independent University of Angola, signal a new era in postwar politics. Angola weathered a civil war that ended only in 2002. "It's important because it's the first time that Angolans are going to an election with the main actors from the civil war era outside of the electoral game," he said. Some voters were undeterred by the controversy and said they were eager to participate in this poll. "I'm going to vote for the first time," said ruling party supporter Daniel Cailane, 21. "I'm excited to give this contribution to my country." Domingos Nicolau, 80, spoke of the hope he had when Angola gained independence from Portugal, and how he was disappointed that the nation's immense oil wealth hasn't trickled down to him or his 12 grandchildren — or, for that matter, the majority of citizens. That's why, after previously supporting the ruling party, he's changing sides. "We want to make a free and a fair change," he told VOA. That is a common refrain on the hectic streets of this seaside capital, where luxury cars and banged-up buses weave through potholed streets, where oil rigs twinkle off the coast at night, lending the only light to coastal neighborhoods that have never had electricity. It's also where one man watches from his pink palace atop Luanda's highest hill, and prepares, after so many years, to step down.